This July saw the eagerly awaited release from Disney Pixar Studios, Cars 2. 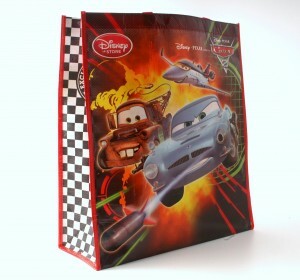 As suppliers to the Disney Store, Keenpac have developed a stunning RPET shopper made from 80% recycled plastic bottles, featuring characters from the ‘must-see’ movie of the summer. The bags are available to purchase from all Disney Stores across Europe, and will no doubt be a huge hit with fans of the big screen and the big streets throughout Europe.